(WASHINGTON, December 2, 2016) – The American Society of Hematology (ASH) will recognize three Choosing Wisely Champions, practitioners working to tackle overuse of hematology tests and treatments, at its 58th annual meeting December 3-6 in San Diego. Choosing Wisely is a program of the ABIM Foundation and Consumer Reports that aims to prompt conversations between patients and clinicians about the necessity and potential harm of certain procedures. As a part of this initiative, ASH has identified 15 commonly used tests, treatments, and procedures in hematology that clinicians and patients should question in certain circumstances to avoid overuse, waste, and harm. Choosing Wisely Champions, a new initiative of the ABIM Foundation, recognizes clinicians who have implemented successful projects to improve quality at their institutions and advance the ideals of the campaign. The three inaugural ASH Choosing Wisely Champions were selected by an ASH taskforce. The honorees will speak at a Special-Interest Session at the ASH Annual Meeting, allowing the Society to recognize their efforts and providing attendees with an opportunity to learn about projects that might be translated to their own practices. To combat variability in blood utilization across the Baylor Scott & White Health system’s hospitals (encompassing 133,550 patients), Dr. Juarez and her colleagues developed an institutional clinical practice recommendation based on published red blood cell utilization guidelines, modified transfusion workflow in the electronic health record, and launched an educational campaign (“Why Give 2 when 1 will do?”). With these collective interventions, the number of single unit transfusions increased by approximately 17 percent during the program period. Single unit transfusions are now the predominant red blood cell transfusion order (comprising nearly 57% of all red blood cell transfusion orders in the hospital system). Documentation of hemoglobin levels prior to transfusion also improved. To avoid potential harm from over-testing patients, Dr. Munoz and his colleagues implemented an intervention designed to test whether the introduction of an automatic alert in an electronic medical record could remind clinicians to carefully weigh the anticipated benefits versus the risks of post-treatment imaging scans for patients with lymphoma. Though the study is ongoing, the automatic alert has reduced the overall number of imaging studies, with the average number of monthly scans falling to 25.3 scans per month over the course of the first three months of the study versus an average 48.3 scans per month in the eight months prior to the introduction of the intervention. Dr. Munoz is trying to transition our efforts from relapse detection solely based on imaging to improved survivorship with a more conscientious use of resources. Dr. Munoz is currently in the process of expanding this project to all Banner Healthcare system sites. Dr. Sarode and his colleagues discovered that approximately 85 percent of thrombophilia tests at UT Southwestern’s two teaching hospitals were ordered incorrectly or incompletely. Thrombophilia tests are frequently ordered (usually by non-hematologists) for patients with acute thrombotic events, often while the patient is on anticoagulation therapy; however, sometimes additional variables can cause these standard tests to return false positive results. These abnormal results are not always checked for reproducibility or accuracy, causing some patients to be inappropriately placed on long-term anticoagulation therapy. To promote appropriate use of testing, Dr. Sarode’s team developed local guidelines and implemented them in the electronic medical record via a series of cascading questions that providers must answer before ordering tests. After implementation of the intervention and an associated education campaign, UT Southwestern has reduced thrombophilia testing for inpatients in the university hospital by more than 90 percent. Drs. Juarez, Munoz, and Sarode will present their successful utilization strategies during the ASH Choosing Wisely Campaign: 2016 Choosing Wisely Champions session at the 2016 ASH Annual Meeting on Monday, December 5, 2016, at 12:15 p.m. PST in Room 6B of the San Diego Convention Center. The American Society of Hematology (ASH) (www.hematology.org) is the world’s largest professional society of hematologists dedicated to furthering the understanding, diagnosis, treatment, and prevention of disorders affecting the blood. For more than 50 years, the Society has led the development of hematology as a discipline by promoting research, patient care, education, training, and advocacy in hematology. The Society publishes Blood (www.bloodjournal.org), the most cited peer-reviewed publication in the field, as well as the newly launched, online, open-access journal, Blood Advances. The mission of the ABIM Foundation is to advance medical professionalism to improve the health care system. We achieve this by collaborating with physicians and physician leaders, medical trainees, health care delivery systems, payers, policy makers, consumer organizations and patients to foster a shared understanding of professionalism and how they can adopt the tenets of professionalism in practice. To learn more about the ABIM Foundation, visit www.abimfoundation.org or connect with them on Facebook and Twitter. 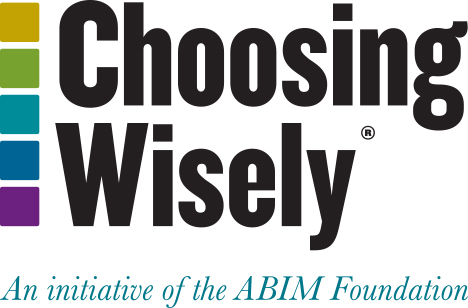 First announced in December 2011, Choosing Wisely®is part of a multi-year effort led by the ABIM Foundation to support and engage physicians in being better stewards of finite health care resources. Participating specialty societies are working with the ABIM Foundation and Consumer Reports to share the lists widely with their members and convene discussions about the physician’s role in helping patients make wise choices. Learn more at www.ChoosingWisely.org.